When the three Potter children, Ben, Tom, and Lindy, visit the zoo one October afternoon, they make an unusual friend in Professor Savant, who speaks to them about an unusual creature known as the Whangdoodle. After they meet the professor again on Halloween, the children begin spending all their free time at his house, learning how to observe the world around them and preparing to travel to Whangdoodleland to meet the last remaining Whangdoodle. Before they can get anywhere near the Whangdoodle, however, the Potters and Professor Savant will have to face such fearsome and unusual creatures as the Prock, Gazooks, Sidewinders, the Splintercat, and the Gyascutus. 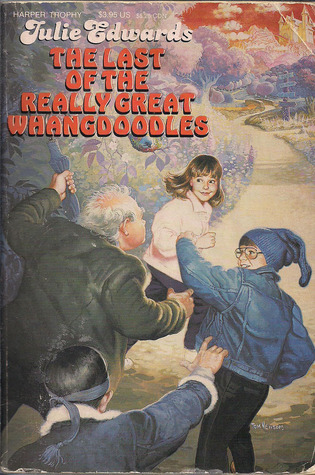 The Last of the Really Great Whangdoodles was read aloud to my third grade class in the 1989-1990 school year. Until this week, I had never read it a second time. To my surprise, it turns out that this book is not just a frivolous fantasy novel, but an interesting meditation on imagination, youth, faith, scientific discovery and, of all things, genetics. At 8 years old, I experienced this story primarily as a quest through a fantastical land that seemed to be part-Oz, part-Fantastica. Now, as an adult, I appreciate all the big questions this story really explores, including whether it is appropriate for human beings to manipulate DNA to create life. I'm not certain that this book's view about "playing G.O.D." (as Professor Savant calls it) necessarily meshes with my values as a Catholic, but because the story is purely fantasy, I would feel comfortable reading it to my kids in order to prompt a discussion about the issues involved and why we may or may not be called to do something other than what the professor decides to do. The rest of the book's message, about being open-minded to scientific exploration, and learning to pay closer attention to the world, does mesh perfectly with the values I try to instill in my children. I don't think the moral grayness surrounding the genetics issue is quite troubling enough to cause me to write off the rest of the valuable material in the book. Overall, this is a solid fantasy novel, though much different than I remembered. I think third grade is actually a bit young to absorb everything this book offers; I'd be more inclined to wait until fifth or even sixth grade. Kids on the higher end of the elementary years will be better able to understand the scientific references in the story, and they will also be more likely to understand the word play of characters like The Whiffle Bird and to recognize the duplicity of characters like the Prock and the Splintercat.